Elon Musk has offered a glimpse of the spacesuit that could clothe those journeying on his company's attempted mission to Mars. The SpaceX founder and CEO revealed a single photograph of the suit design on his Instagram account today, saying that more details would soon follow. Musk, who is also the co-founder and CEO of electric car brand Tesla, accompanied the image with a caption explaining the suit was a working prototype and not just a mock-up. He said that a key challenge of the design process had been creating a functional suit that had the right aesthetic. "First picture of SpaceX spacesuit. More in days to follow," he wrote. "Worth noting that this actually works (not a mockup). Already tested to double vacuum pressure. Was incredibly hard to balance esthetics [sic] and function. Easy to do either separately." The image shows a minimal white spacesuit with grey contrast panels and piping. An American flag is the only apparent marking, appearing on the right shoulder. Musk is attempting a number of interplanetary manned missions with his company SpaceX – short for Space Exploration Technologies Corporation. A key goal of the aerospace manufacturer is to make it to Mars, with the view to establishing human habitation. Musk has previously presented a timeline for creating a self-sustaining city on the Red Planet by 2022, saying that interplanetary colonisation was necessary to avoid "an inevitable extinction event" for the human race. The newly revealed spacesuits could be used on that eventual Mars mission. In the more immediate term, they could be employed for a journey around the moon that SpaceX has contracted to take two private individuals on, potentially in 2018. 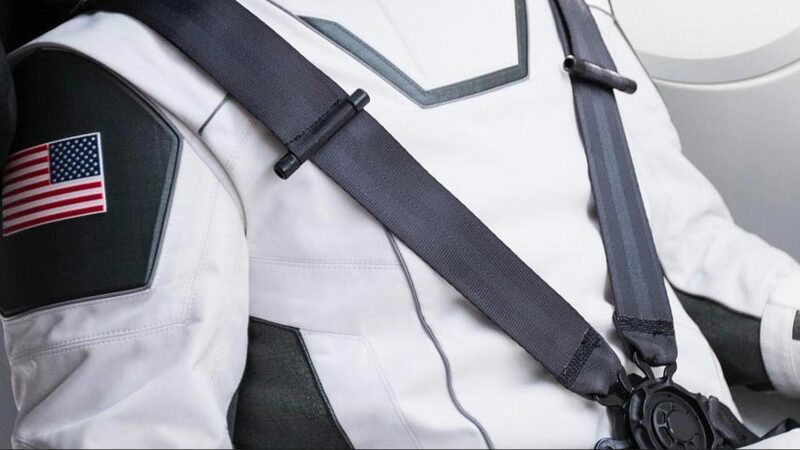 The suit is very different in appearance to one recently pitched by French designer Clément Balavoine, whose conceptual design targeting SpaceX travellers was form-fitting and dark-coloured. Its precise tailoring was meant to support the musculoskeletal system during space travel. The entry of private companies into the field of space travel appears to have ignited the imaginations of many designers recently. A coffee cup for space was one of 2016's Designs of the Year, while MAD founder Ma Yansong designed a range of furniture for people to use on Mars, and Christine Lew created objects for overlooked aspects of space colonisation in her Central Saint Martins graduate project.